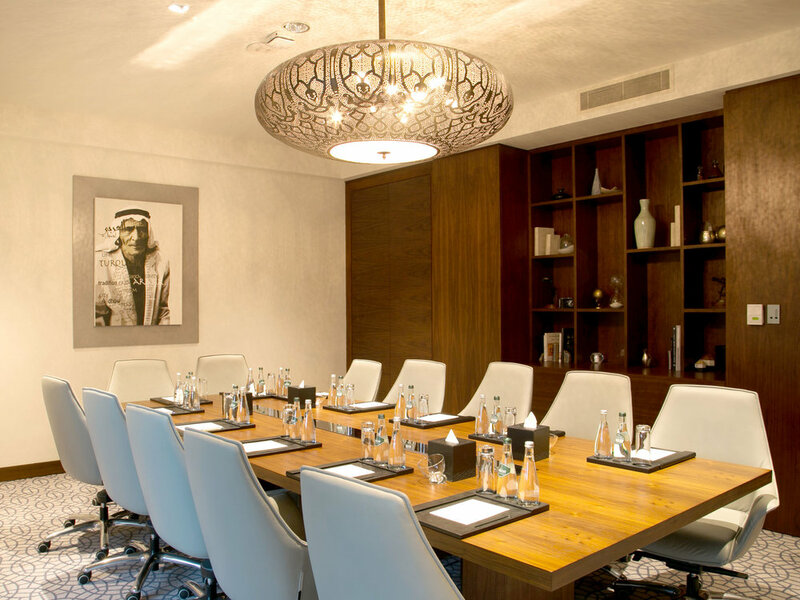 Manzil Downtown Dubai is an upscale boutique hotel from Vida Hotels and Resorts with a contemporary Arabesque design, offering engaging service based on Arabic hospitality. 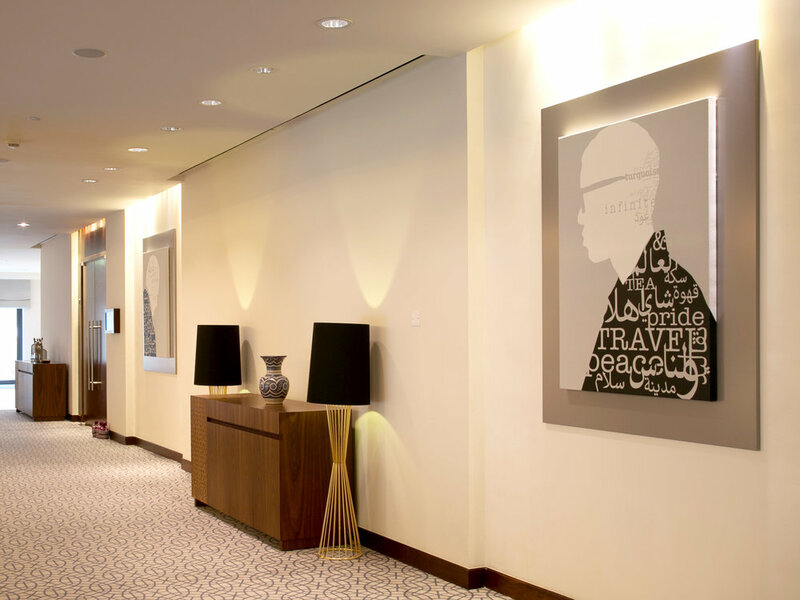 In 2014, the hotel underwent a major renovation and as part of this Capsule Arts supplied a number of new artworks across the hotel. 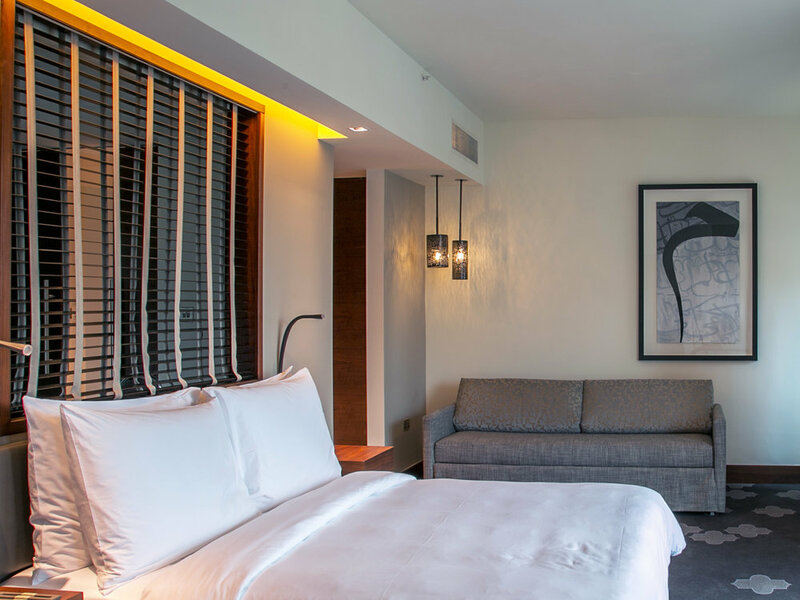 HBA, the interior design firm leading the renovation, wanted a new art package to be developed for the hotel that reflected the culture and heritage of the UAE while avoiding cliches and remaining very current, in keeping with the interior design. 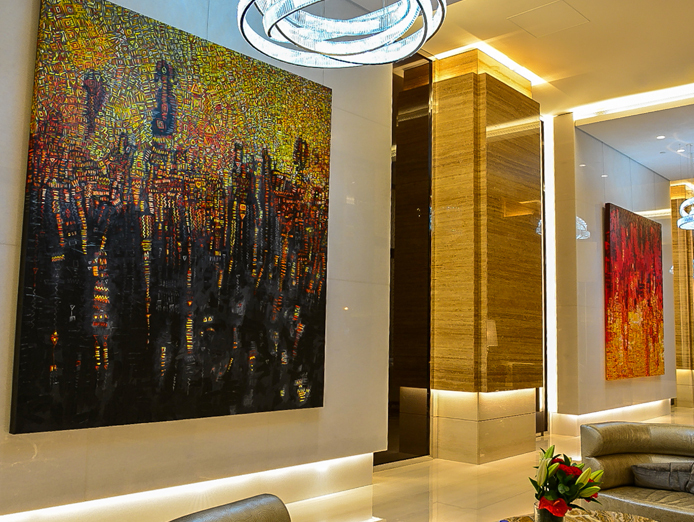 Capsule Arts put together a series of artworks working with artists from the UAE and Middle East region, along with art developed in-house, which brought this contemporary Arabic touch to the hotel. In the lobby, a large-scale graphic work by Saudi artist Fatimah Al Nemer was installed, along with a photographic print by renowned Emirati artist, Maitha Demithan, featuring an arrangement of golden burqa masks traditionally worn by Emirati women. Elsewhere in the hotel, we framed a series of real burqa masks in abstract layouts. 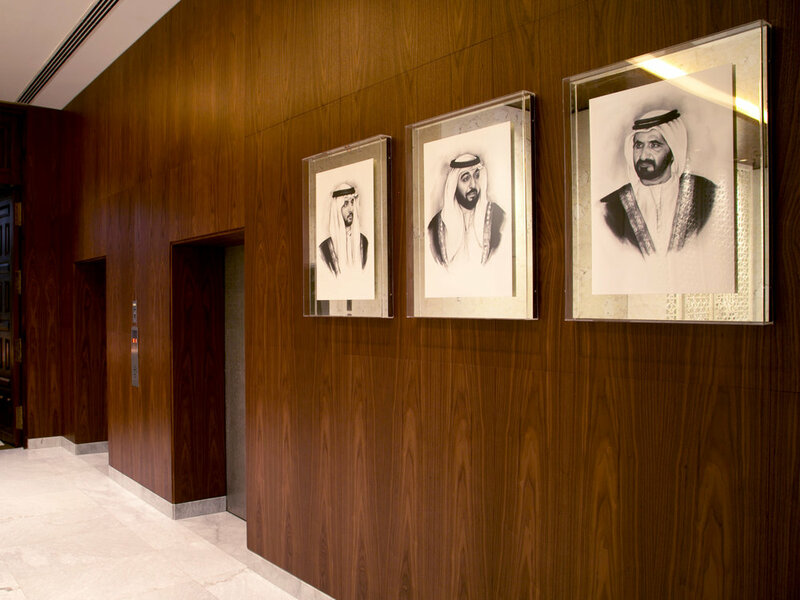 For the meeting room and corridors in this area, we commissioned a series of graphic artworks on canvas which combine images and text relating to UAE heritage. Meanwhile in the Burj view suites, Capsule Arts commissioned a calligraphic artwork featuring the Arabic letter ‘ma’, in a reference to the hotel’s name, Manzil. 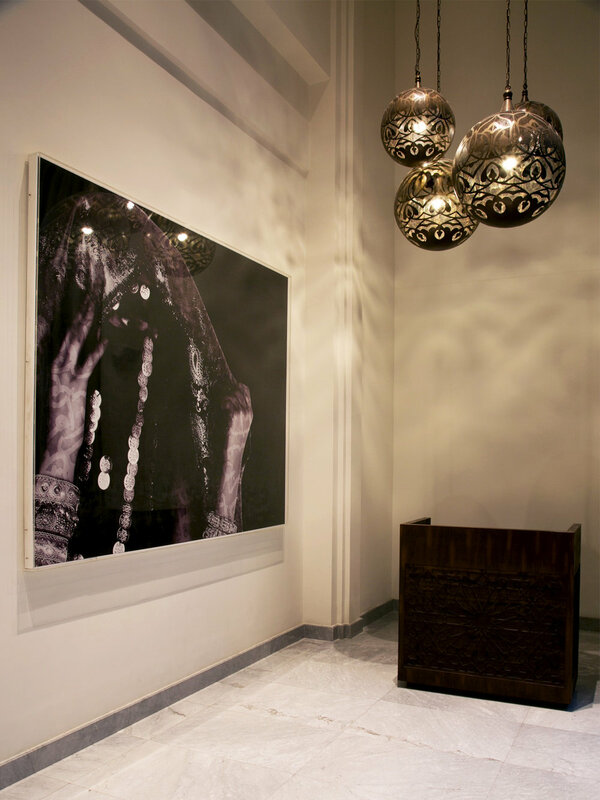 Maitha Demithan and Fatimah Al Nemer are featured in the hotel lobby. For the graphic works for the meeting room, Capsule Arts commissioned Dubai-based artist Lama Khatib Daniel, who also features in our limited edition art print collection. Other artists included in the project are calligraphy artist Nadia Rehman, UAE photographer Paul Thuysbaert and portrait artist Vijay Narayan.